The Universe contains galaxies, stars, black holes, planets, comets and Milkyburnenergyescapegalaxiesgravityheliumicelightmeteorsnightorbitsstars . A star is a huge ball of gas, mostly hydrogen and Milkyburnenergyescapegalaxiesgravityheliumicelightmeteorsnightorbitsstars . Nuclear fusion reactions inside the star release enormous amounts of Milkyburnenergyescapegalaxiesgravityheliumicelightmeteorsnightorbitsstars . Stars are very hot and give off their own Milkyburnenergyescapegalaxiesgravityheliumicelightmeteorsnightorbitsstars . This is why we can see the Sun during the day, and distant stars in the Milkyburnenergyescapegalaxiesgravityheliumicelightmeteorsnightorbitsstars sky. 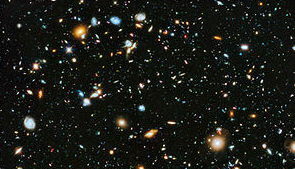 A galaxy is a large group of many millions of Milkyburnenergyescapegalaxiesgravityheliumicelightmeteorsnightorbitsstars . Our Sun is just one of at least 200 billion stars in our galaxy, the Milkyburnenergyescapegalaxiesgravityheliumicelightmeteorsnightorbitsstars Way. The observable universe contains around 80 billion Milkyburnenergyescapegalaxiesgravityheliumicelightmeteorsnightorbitsstars . A black hole cannot be seen because light is unable to Milkyburnenergyescapegalaxiesgravityheliumicelightmeteorsnightorbitsstars from it. A black hole forms when a large star collapses in on itself because of Milkyburnenergyescapegalaxiesgravityheliumicelightmeteorsnightorbitsstars . A planet is a large rocky or gaseous object that Milkyburnenergyescapegalaxiesgravityheliumicelightmeteorsnightorbitsstars a star. Their Milkyburnenergyescapegalaxiesgravityheliumicelightmeteorsnightorbitsstars are almost circular. Comets are balls of Milkyburnenergyescapegalaxiesgravityheliumicelightmeteorsnightorbitsstars and dust. Meteors are small rocks. They usually Milkyburnenergyescapegalaxiesgravityheliumicelightmeteorsnightorbitsstars up when they enter a planet’s atmosphere, forming a ‘shooting star’.